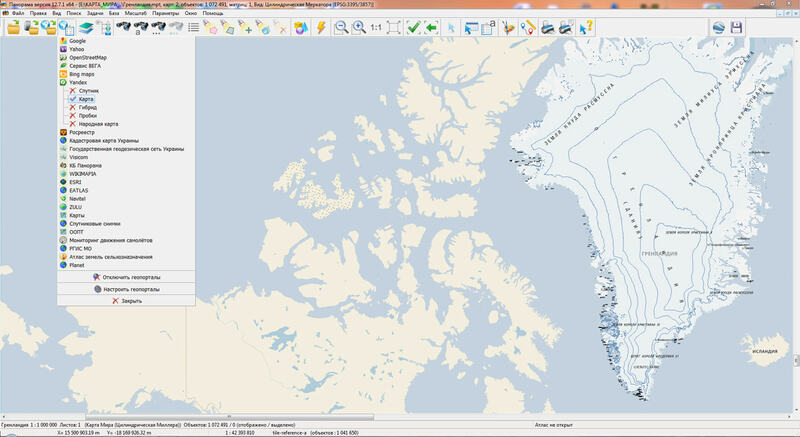 KB "Panorama" prepared a digital geographical map of scale 1: 1 000 000 in format SXF onto the territory of Greenland - an autonomous territory subordinate to the kingdom of Denmark. VMap0 data obtained according to information from the website www.gis-lab.info has served as source for map's preparation. The map contains information about the quantity of inhabitants for cities and the names of settlements in Russian. As additional materials the World map of scale 1: 5 000 000 and data of OpenStreetMap were used. The map is led to the classifier of geographical maps of scale 1: 1 000 000 (1mogk13g.rsc). It can be used for the general estimation of the terrain and studying of an environment, an ensuring of educational process, as a basis for creation of geographical maps of smaller scale, thematic and special maps and solving other tasks. The map is distributed free according to the free licence. Digital geographical map of scale 1: 1 000 000 in format SXF is available for downloading on page the "Digital maps and images". 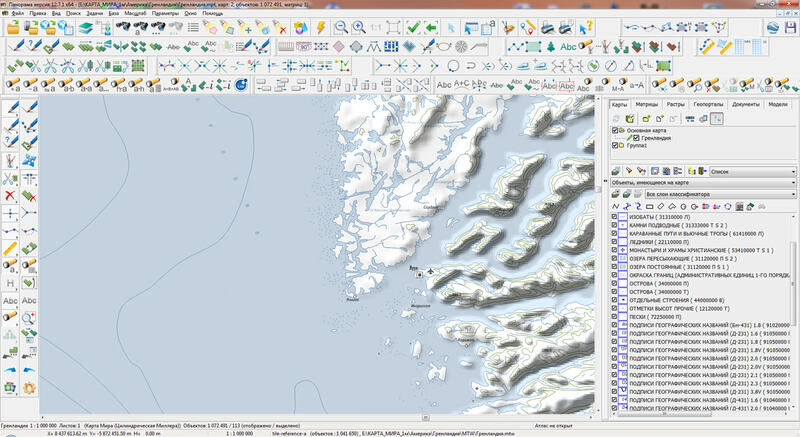 A kit of geographic maps of scale 1: 1 000 000 is supplemented with a map of Greenland 1 GIS "Panorama"
In KB "Panorama" the GIS Server version 8.5 is developed. 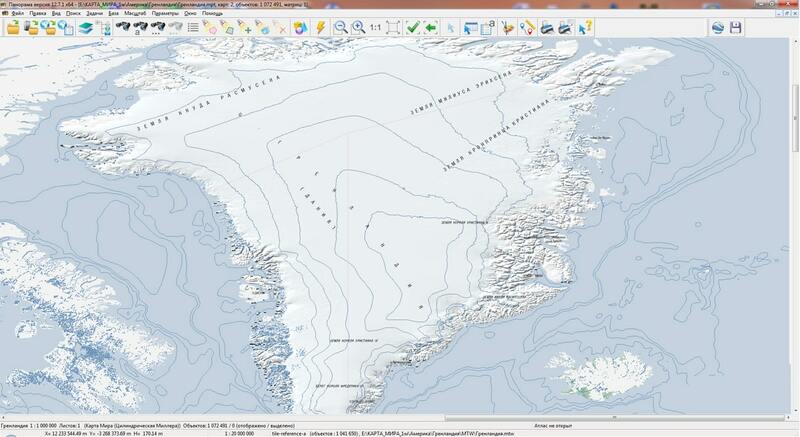 The new version expanded the set of automated procedures for processing spatial data on the server. They perform various types of quality control of digital vector terrain maps and the correction of errors. 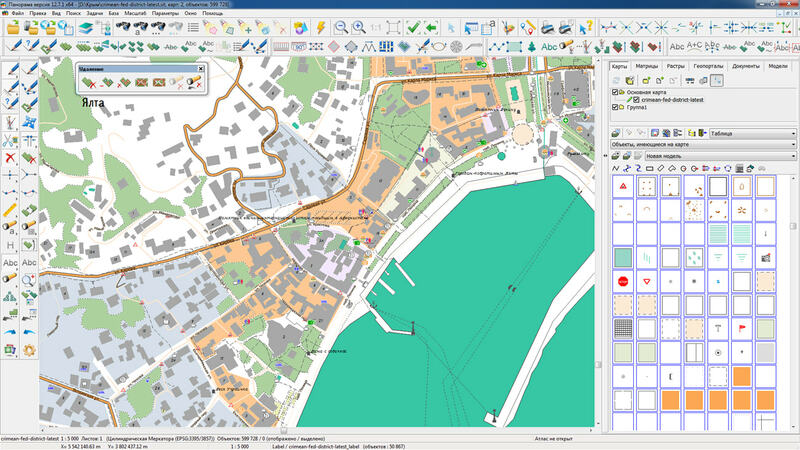 The program provides control of completeness and correctness of metadata, correspondence of geodetic and rectangular coordinates of a passport, correspondence of the nomenclature and coordinates of the sheet, the correctness of the projection parameters, checking a closing of polygons, vertex duplications, self-crossings, locations of the internal contours, duplication of objects, degeneracy, coordination of contours of adjacent and crossed objects, coordination of water levels and hydrography objects, a direction of the water course objects, completeness of mandatory characteristics, absence of non-valid characteristics, correctness of a format and values of characteristics and much more. The procedure for checking the quality of digital maps, as well as other procedures, can be called remotely from desktop or web applications. The developers of desktop applications can use the GIS ToolKit for Windows or the GIS Constructor for Linux by invoking commands for placing data into virtual folders, their subsequent processing and reading the results of the execution of procedures. 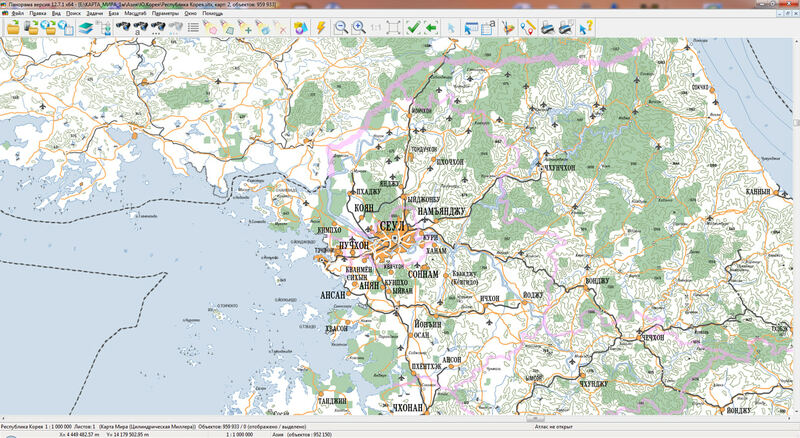 For web applications, GIS WebToolKit SE is used, which provides access to REST-requests for processing to GIS WebService SE. 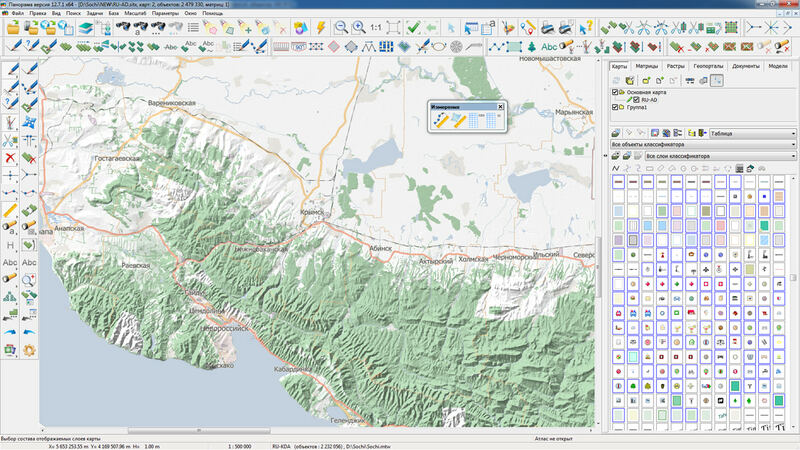 The structure of the GIS Server includes a set of classifiers of the RSC format and control schemes for digital topographic maps of scales from 1:25 000 to 1: 1 000 000. 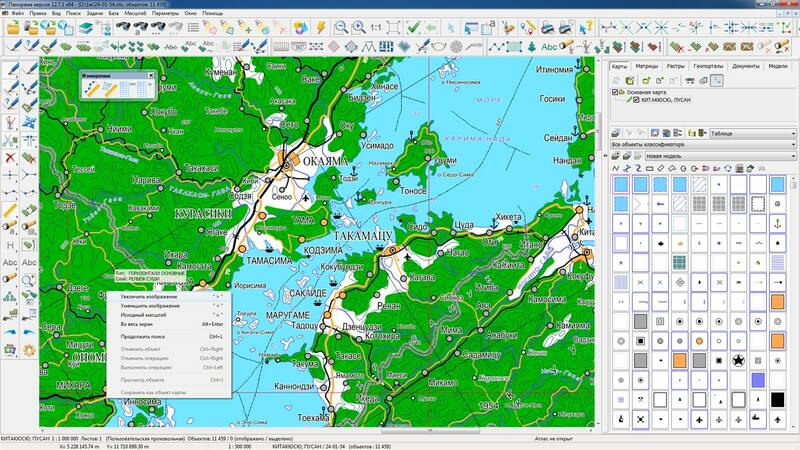 The composition of classifiers and control schemes of xml format can be customized by means of GIS "Panorama" and other desktop applications. The checking results are recorded in the form of checking's tables in html format in accordance with the report templates and the composition of the control schemes. Customization of report templates can be done by various text editors. 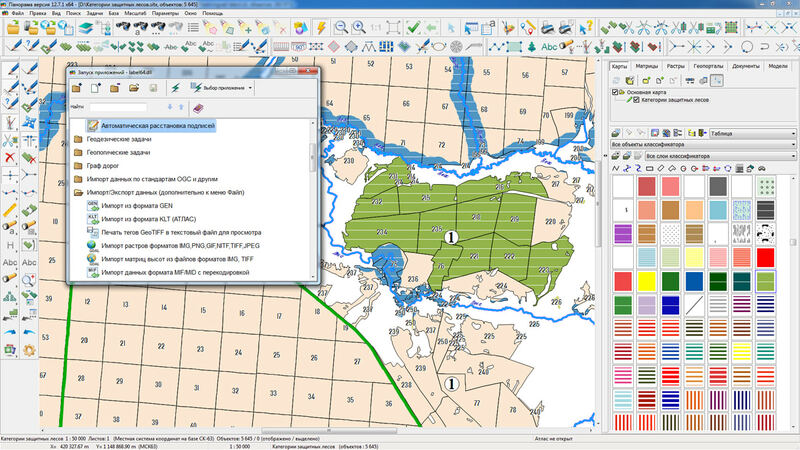 More detailed information on setting up control procedures is given in the documents "GIS Server. System programmer's guide" and "Complex of the automated quality control and correction of digital maps". The new version of the program is available for download on the Download page. 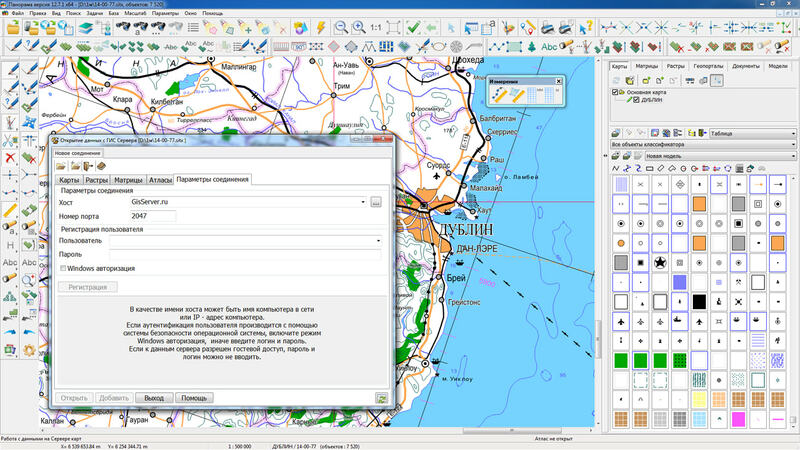 GIS Server implements a platform for automating the processing of spatial data 1 GIS "Panorama"
Specialists of KB "Panorama" prepared a video lesson "Transformation of raster data". 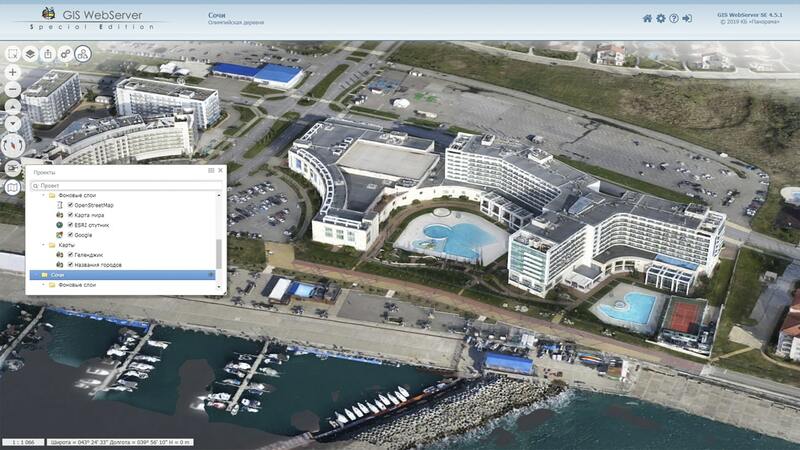 It is intended for the English-speaking users independently studying possibilities of the GIS "Panorama". In this lesson, you will learn how to transform raster data. 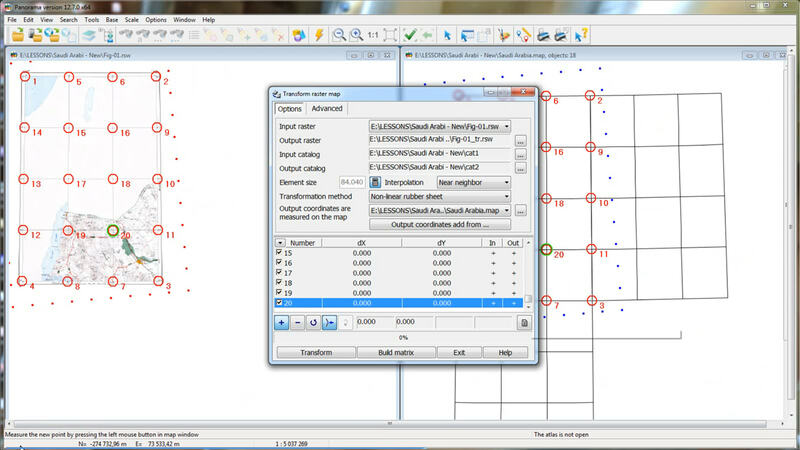 In a teaching material a transformation of rasters by a set of points and nomenclature sheet will be considered. Tools of transformation are in the section "Transforming rasters", which can be opened using the menu item "Run applications". 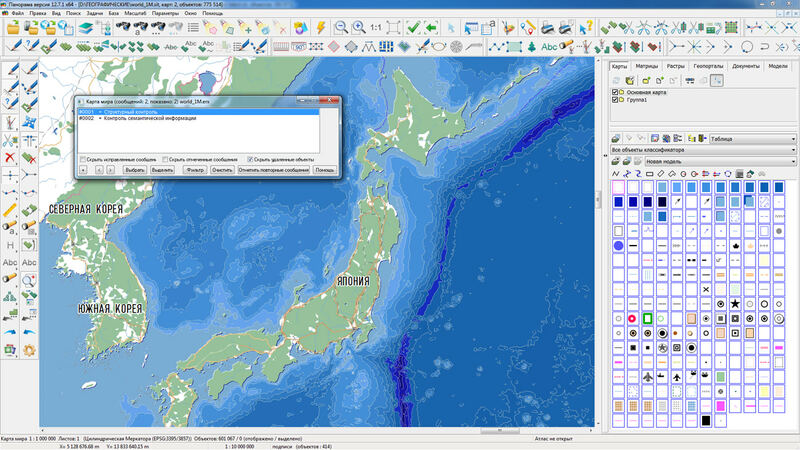 In a video lesson a work with dialog "Transform raster map" is shown. Users will get acquainted with various types of transformations and interpolation methods. The actions shown in a video lesson will help to learn how to carry out a placing a raster or to transform the image. Previously other video lessons of this series were published: "Object creation tools", "Operations above points", "Classifier edition", "Building of a 3D object", "Subobject creation. Work with objects samples". You can get acquainted with training materials in English in the section "Video lessons". Section of video lessons in English for self-study of geoinformation systems of KB "Panorama" is supplemented with materials on the transformation of raster images 1 GIS "Panorama"
In KB "Panorama" the GIS "Panorama" version 12.7.1 is developed for the x64 platform. In the new version, the task “Quarters generalisation” has been refined, designed for automatic uniting of closely located same-type quarters and adjustment of quarters with linear objects of the road network. In order to eliminate the contradictory overlap of the objects of the map of the derived scale, there are added the processes of adjustment of quarters and removing the buildings in the area of quarters with black filling. The automatic correction of the metrics of polygon and linear objects is improved. In polygon objects, there are removed the outliers and vertex duplications, all types of self-crossings, crossings of contours and errors of locations of subjects are corrected. Adjacent contours of one object are combined, intersecting contours are divided into separate objects. In the objects having errors of locations of subjects, the description order is corrected: the subject having the maximum area becomes the main one, the subjects located inside other subjects are stored into separate objects. In linear objects, there are removed the outliers and vertexes duplications, coinciding segments, the self-joining is corrected (joining of non-consecutive segments of one contour). The contours having the self-joining, are divided into separate objects. To correct the metrics of objects, it is necessary to perform "Check of self-crossings and locations of subjects" in the "Edit" mode. The corrected objects have a topologically correct metric description, which provides the calculation of correct areas, simplifies the construction of road network graphs, and allows you to combine and cut areas of vector data according to specified conditions. 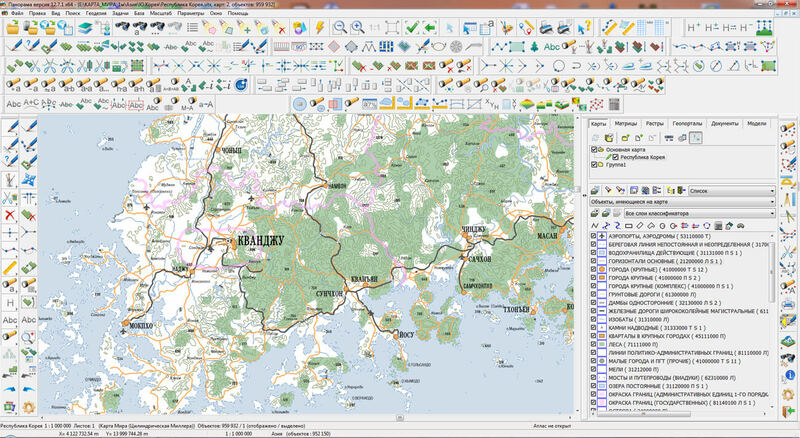 Automatic correction of the metrics of map objects allows you to speed up the processing of vector maps obtained from any sources that do not have a strict standard for checking the metric information. 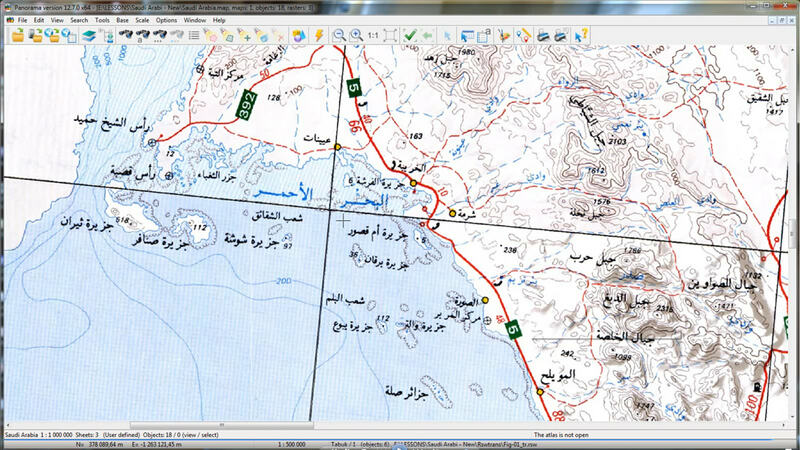 In the task the "Checking the quality of a vector map" according to a control scheme, tools of checking the metadata of the map are added. Metadata is formed by the task the "Map passport" according the standards of ISO 19115:2003, Geographic information - Metadata and ISO/TS 19139, Geographic information - Metadata - XML schema implementation. Metadata is saved in the XML format as a separate file onto each sheet of the map. Metadata allows you to enter additional information about the map (data on the manufacturer, data on the technology of creation) and use it in the conducting the automated banks of the spatial data. 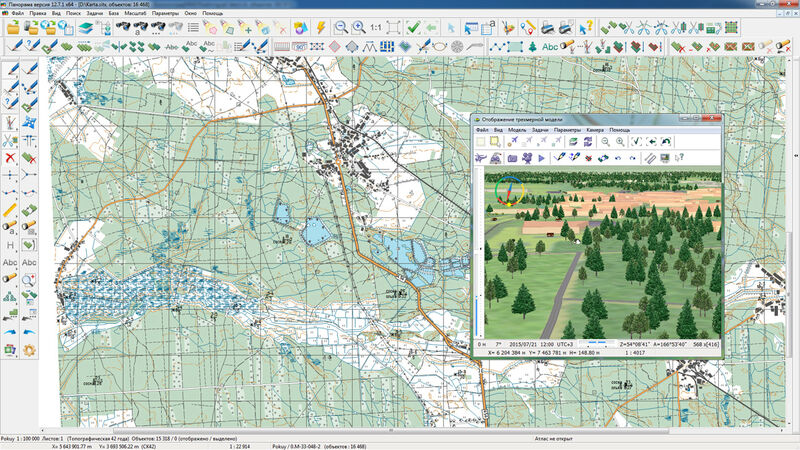 In the "Map Editor", the tools for viewing the results of checking the vector map are improved. To improve the quality of checking the metrics of objects of vector map, the checking program performs an excessive number of tests that can generate repeated error messages. The ability to filter repeated messages has been added into the program of viewing the checking results. To disable repeated messages, click the "Mark repeated messages" button and select the option "Hide marked messages". The mode of uniting (merge) selected polygon objects has been improved. There is implemented a formation of subobjects-multipolygons from those selected objects that are located from the objects to be merged at a distance that is greater than that specified in the parameters of the "Map Editor". The mode "Formation of a common external border" of the Map Editor has been improved. 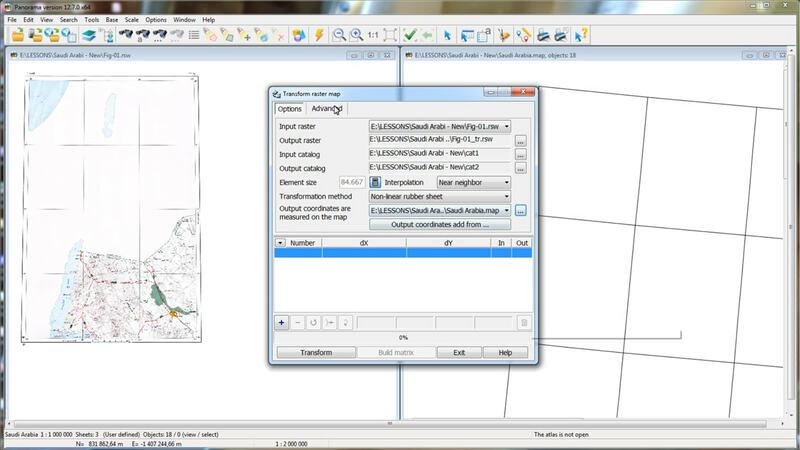 This mode allows you to create a common external border for map objects that are at an admissible distance. The allowable distance between adjacent objects is set in the parameters of the Map Editor (join tolerance). Display of vector symbols is improved. New symbols automatically compose complex labels, which are used to indicate the characteristics of forests, bridges, dams, tunnels, rivers, canals, fords, ferries, passes and other objects on the map. The main feature of complex labels is the presence of a horizontal line - the separator of the upper and lower labels of the main characteristics. Each label can be formed from several characteristics of an object and contain fragments of permanent text between characteristics. For each digital characteristic, you can specify the number of digits after the decimal point, for symbolic characteristics - word splitting and replacement with abbreviated names. The abbreviation of words of symbolic characteristics (of the type “Name”) is carried out according to the semantics “List of abbreviations”, which contains the corresponding full and short names (abbreviations). Sorting the maps of SITX format with encryption of stored data by the user password is accelerated. The document "Description of technology of creating and updating digital topographic maps" has been updated. This document describes the technology for creating and updating digital topographic maps based on remote sensing of the Earth. 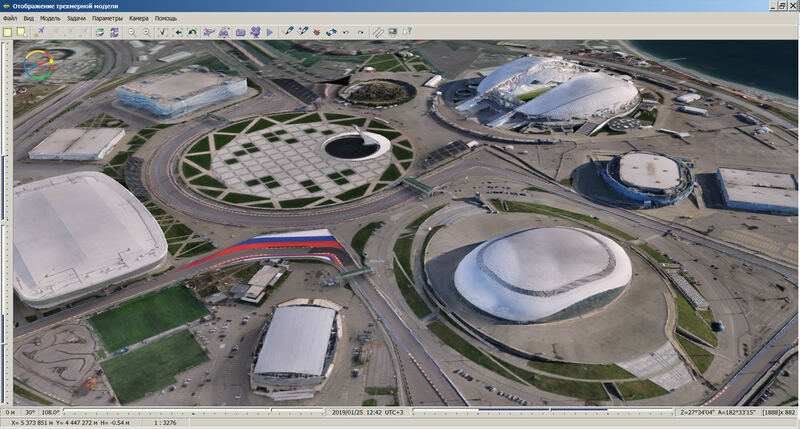 The technology is based on the use of software the PHOTOMOD DFS and the GIS "Panorama" x64. In the “Navigator 3D” task, there is complemented the mode of loading models from formats of Collada, TLS, OC3 into the DB3D three-dimensional tile database. For all formats of the original models, editing the coordinates of the model binding point is supported. The task “Converting geodetic heights of WGS-84 to normal heights” has been improved. It is intended for transition to heights on a geoid (normal heights) from geodetic heights on a general ellipsoid WGS-84. For example, downloaded from the SRTM format (radar topographic survey) and others. The inverse transformation of matrixes from normal heights (mean sea level) to the system of geodetic heights WGS-84 has been implemented. For finding the causes of repeated errors in the program's work the "Diagnostic log" is added. If some action with the program causes an error, then for its diagnosing, it is desirable to enable the "Diagnostics log" and to repeat the action causing an error. The diagnostic log is created in the folder \ProgramData (or \Users\All Users), which is usually located on the C: drive. Enabling the diagnostic log may be done in the menu \Options\Diagnostics log. Enabling the mode and displaying the name of the log file is also implemented in the "Placement of data" dialog - menu item \Options\Placement of data. The generated log file describing the error can be sent to the technical support of KB "Panorama". The new version of the program is available for download in the Download section. 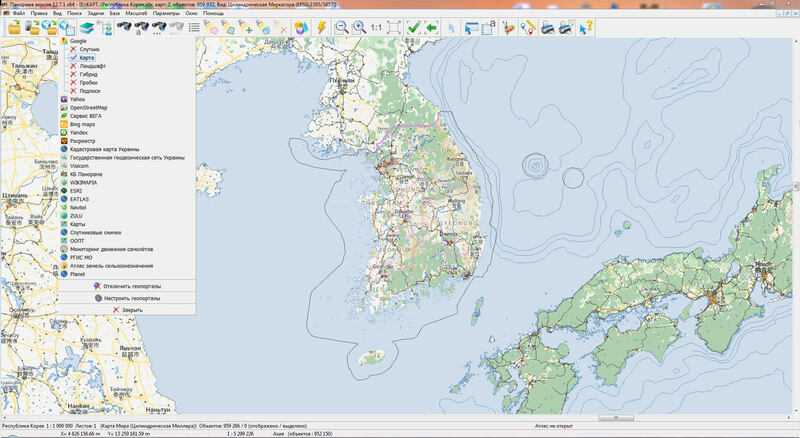 In GIS "Panorama" x64, the degree of automation of creating, updating and generalizing digital topographic maps is enhanced 1 GIS "Panorama"
KB "Panorama" prepared a digital geographical map of scale 1: 1 000 000 in format SXF onto the territory of the Republic of Korea. VMap0 data obtained according to information from the website www.gis-lab.info has served as source for map's preparation.